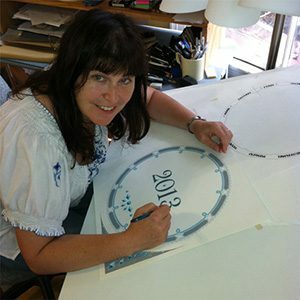 All Ketubah Personalization Hand Calligraphy is done personally by Mickie. We strongly recommend that when you purchase one of Mickie’s Ketubot, you also choose to have her personalize your ketubah. Mickie does not use ink jet printers, digital files or computers for personalization. All ketubot are carefully and personally calligraphed by hand by Mickie. After submitting your Personalization Form, Mickie fills in all of the blank spaces in pencil to line up your information (names, date, location, etc). Since the information can be of varying length, Mickie will make sure that it fits aesthetically. When necessary, she will add curlicues to fill up the extra space. 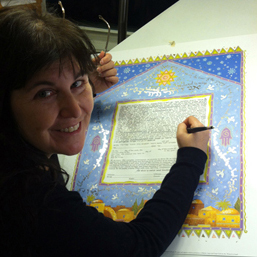 Eran will then proof the ketubah prior to Mickie completing the customization process in ink. So what does this actually look like? You can see in the image below the text prior to having Mickie personalize it and after she has filled in all of the information. Her goal is to match the hand calligraphy as closely as possible to the printed text. We take great pride in filling in ketubot correctly, quickly and beautifully. 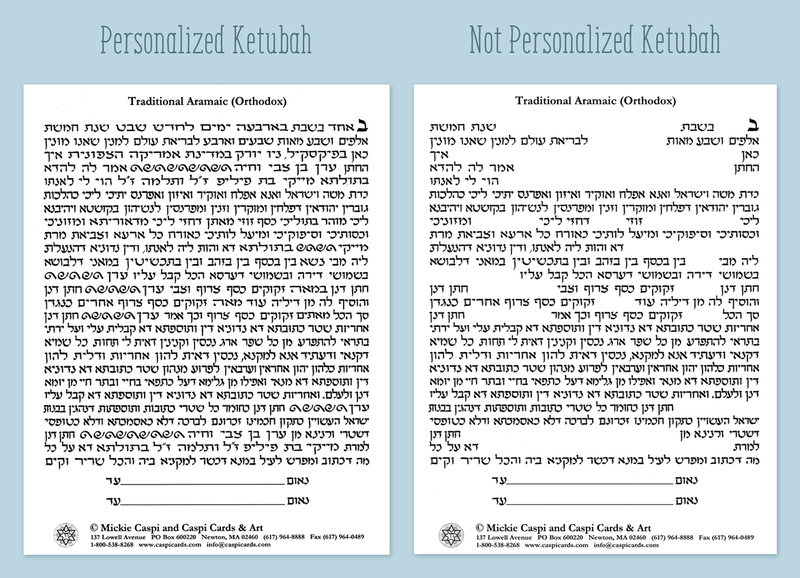 Normally, you receive a personalized ketubah within 2 weeks. Often the Ketubah Personalization Hand Calligraphy is completed even quicker. Sometimes events sneak up on you or you just didn’t realize you need to order a ketubah. No worries – we can even ship the same day in extreme cases.